Paul Barry from Media Watch thinks this story should have been covered-up. Get stuffed lost soul Paul Barry. This is our planet, not yours. "Once it's over [400 ppm], it won't go back," said Paul Fraser, dubbed by CSIRO as the Air Man of Cape Grim, and now a retired CSIRO fellow. "It could be within 10 days." The approaching global CO2 threshold comes as climate change looks like becoming one of the key issues in Australia's election campaign. The Turnbull government has made clear it will oppose Labor's proposals for an emissions trading scheme that will again put a price on carbon pollution. New data out on Tuesday show that emissions from the country's main electricity grid covering the eastern states have risen 5.7 per cent - or 8.7 million tonnes - in the year to April compared with the final 12 months of the carbon tax that the Abbott government scrapped in July 2014, according to energy consultants Pitt & Sherry. The share of coal in the National Electricity Market has risen to 76.2 per cent - its highest level since September 2012 - from 72.3 per cent during the period since June 2014, the consultants' latest Cedex report said. Mark Butler, Labor's shadow environment minister, said the Cape Grim landmark reading was "deeply concerning". "While the Coalition fights about whether or not the science of climate change is real, pollution is rising. And it's rising on their watch," Mr Butler said. Greens deputy leader Larissa Waters said the Cape Grim result "should act as a global wake-up call and must shock both Australian big political parties out of their blind coal-obsession which is literally cooking our planet and our Great Barrier Reef". "Our atmosphere cannot take any new coal mines – both the old parties must stop approving them and revoke their approval of the Adani coal mine [in Queensland] at both the state and federal level," Senator Waters said. A spokesman for Environment Minister Greg Hunt defended the government's climate policies. "There is now absolutely no doubt that we will beat our 2020 target" of cutting 2000-level emissions by 5 per cent by then, the spokesman said. "We are playing our part to tackle climate change and our 2030 target [of cutting 2000-level emissions about 19 per cent] is ambitious and significant," he said. "Labor has nothing more than a plan to bring back the carbon tax and hike electricity prices." Cape Grim's readings are significant because they capture the most accurate reading of the atmospheric conditions in the southern hemisphere and have records going back 40 years. With less land in the south, there is also a much smaller fluctuation according to the seasonal cycle than in northern hemisphere sites. That's because the north has more trees and other vegetation, which take up carbon from the atmosphere in the spring and give it back in the autumn. So while 400 ppm has been temporarily exceeded at the other two main global stations since 2013 - in Hawaii and Alaska - they have dropped back below that level once spring has arrived because of that greater seasonal variation. David Etheridge, a CSIRO principal research scientist, said atmospheric CO2 levels had fluctuated around 280 ppm until humans' burning of fossil fuels and clearing of forests set in process rising levels of greenhouse gases almost without pause since about 1800. "It's been upwards pretty much all of the time," Dr Etheridge told Fairfax Media. "This is a significant change, and it's the primary greenhouse gas which is leading to the warming of the atmosphere." The following chart, compiled by CSIRO researchers using atmosphere and ice core readings, show how CO2 levels have risen over the past 2000 years. While the 400 figure is in itself of no particular note, compared with 399 or 401, it was a marker likely to carry important symbolism. "People react to these things when they see thresholds crossed," Dr Etheridge said. While the fraction may seem small, it is 0.04 per cent of the atmosphere. By comparison, a similar level of alcohol would be close to the legal driving limit in Australia. "These things act at low concentrations," he said, noting that ozone-destroying chemicals at levels of parts per trillion were enough to damage that important component of the atmosphere. The impending 400 ppm reading at Cape Grim comes at an awkward timing for CSIRO, which is the midst of cutting 275 jobs, many of them in climate science. While CSIRO has not confirmed the number of researchers it will cut from the 30 or so involved in analysing CO2 levels in ice and the atmosphere, Fairfax Media understands about one-third will go. "CSIRO is again producing world-leading climate science, and it's reprehensible that the Turnbull Government is allowing the slashing of CSIRO's capacity to ring the alarm bells the world needs to hear," Greens Senator Waters said.Fairfax Media sought comment from CSIRO on the size of the job cuts. In justifying the cuts to climate modelling and monitoring programs, CSIRO chief executive Larry Marshall said that as climate change had been proved, resources could be diverted to climate mitigations and adaptation. But Dr Etheridge said monitoring would continue to be vital. "It's like going on a diet and not measuring yourself," he said, noting the world's nations had committed to cut back emissions of greenhouse gases that are helping to drive up global temperatures. Ed Hawkins, a climate scientist at the UK's University of Reading, has constructed the following animation showing how the world has warmed in the past 166 years. Dr Etheridge said that while a reduction in emissions could slow the increase of temperatures, it would likely take many years of net-negative emissions - effectively removing the gas from the atmosphere - to push CO2 levels back below 400 ppm. "It would take a lot of emissions reductions - and probably negative emissions for some period, decades - before we see CO2 reduce in concentration," he said. Research to be published soon by CSIRO has shown the ocean would act against any drop in atmospheric CO2. The seas would likely give back some of the extra CO2 it has absorbed - as it did during the "Little Ice Age" during the middle ages - delaying any drop in levels of CO2 in the atmosphere, he said. Dr Fraser, who helped set up the Tasmanian site in the 1970s, said CO2 levels were rising fast, at about 3 ppm a year. The precise timing of the 400-ppm mark at Cape Grim would probably take some time to confirm. "On the day it happens, we won't recognise it," he said. "It will take a few weeks to verify." 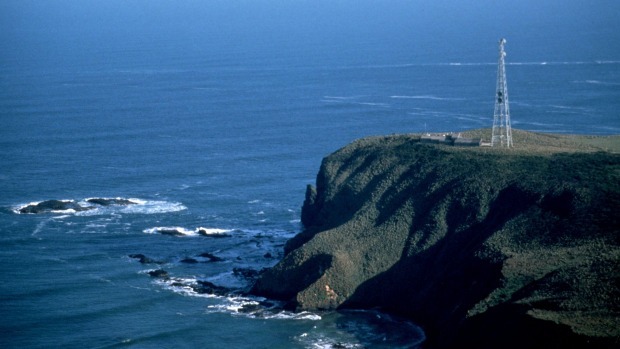 Sam Cleland, manager of Cape Grim, said the site was in "the teeth of the Roaring Forties", the band of powerful winds in latitudes of about 40 degrees south of the equator. "Our job is to find the cleanest air in the world and measure the pollution in it," Mr Cleland said. The baseline data draws on winds reaching Cape Grim from the south-west. "Three days ago, they were coming from an area not far off the Antarctic coast," he said. A year ago, Cape Grim's CO2 readings were about 396.7 ppm, implying a jump of more than 3ppm since. Part of that increase would have been influenced by the El Nino weather event in the Pacific. During such years, ocean take-up of both heat and CO2 from the atmosphere is reduced. Since Cape Grim was set up in 1976, CO2 readings have increased from 330 ppm to the brink of 400 ppm. That implies an average increase of less than 2 ppm per year during that period - but quickening in the more recent past towards 3 ppm or more.